Have a great time with this Adrenaline Cross over obstacle course....run and hid in this cool ride then escape down the tall double lane slide !! ***ATTENTION !! Your reservation is not completely confirmed until a Number 1 Party.com rep contacts you. WHY? Because sometimes rides are available but there is not enough workers to get the rides in all the different places. For instance we could have a bunch of parties in Birmingham and you could reserve a ride in Stevenson and that could be a situation where we are to spread out with our workers. We do however try our very best to fulfill ALL our online reservations. Please be assured that this is very very rarely an issue. A Number 1 Party.com rep will contact you via phone or email within 24hrs of your reservation. 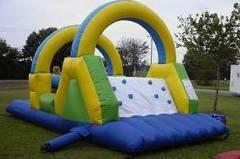 Have a great time with this Mini Obstacle course made for the little ones!! ***ATTENTION !! Your reservation is not completely confirmed until a Number 1 Party.com rep contacts you. WHY? Because sometimes rides are available but there is not enough workers to get the rides in all the different places. For instance we could have a bunch of parties in Birmingham and you could reserve a ride in Stevenson and that could be a situation where we are to spread out with our workers. We do however try our very best to fulfill ALL our online reservations. Please be assured that this is very very rarely an issue. A Number 1 Party.com rep will contact you via phone or email within 24hrs of your reservation. 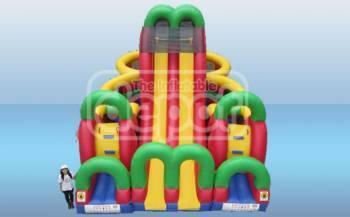 Have a great time with this Obstacle Course made for the little tikes!! ***ATTENTION !! Your reservation is not completely confirmed until a Number 1 Party.com rep contacts you. WHY? Because sometimes rides are available but there is not enough workers to get the rides in all the different places. For instance we could have a bunch of parties in Birmingham and you could reserve a ride in Stevenson and that could be a situation where we are to spread out with our workers. We do however try our very best to fulfill ALL our online reservations. Please be assured that this is very very rarely an issue. A Number 1 Party.com rep will contact you via phone or email within 24hrs of your reservation. Yep we did...we went and bought another 120 ft obstacle course so the 120 ft fun obstacle course will be more available than ever before !! 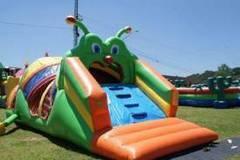 Have a great time with this Cool Swamper Stomper Obstacle course...54 feet of up and down fun ...wow what a blast !! ***ATTENTION !! Your reservation is not completely confirmed until a Number 1 Party.com rep contacts you. WHY? Because sometimes rides are available but there is not enough workers to get the rides in all the different places. For instance we could have a bunch of parties in Birmingham and you could reserve a ride in Stevenson and that could be a situation where we are to spread out with our workers. We do however try our very best to fulfill ALL our online reservations. Please be assured that this is very very rarely an issue. A Number 1 Party.com rep will contact you via phone or email within 24hrs of your reservation.